one is under high physical or psychological stress. 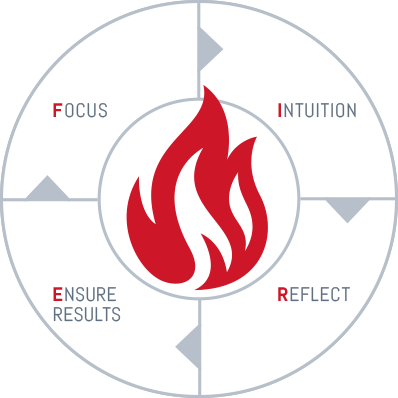 Based on Dr. Jüttner’s experience, during his day and night job, he identified four key factors that he brought together in the F.I.R.E.-Model: to focus, use your intuition, reflect and ensure results. The Model helps decision makers improve the quality of their decisions in stressful situations. Do you have the right „focus“? Especially in unclear, chaotic situations it is necessary to reliably separate important from unimportant factors and use the scarce resources at your disposal for those factors that are most relevant for you to succeed. Align forces and clearly prioritize. Why are clear and consistent goal setting and a focus without distraction important and how can you achieve that? Especially in unstructured decision-making situations, rational decisions are expected from most experts. But that’s not how humans function! If decision-makers rely on rational only in difficult situations, they overlook an essential potential that lies within all of us: intuition. Intuition is our built in fuzzy-logic that does not only know black and white but also all shades of gray. In situations when push comes to shove, high stress levels are the worst conditions for rational decisions. How can you stay cool and use your intuition? The more we focus on the important aspects and block out the unimportant aspects, the better performance we achieve. Of course! But what happens when the reality or rather the world around us changes? It is still applicable, facts don’t stop existing just because you are ignoring them. So we don’t fall into this trap, we need to focus on an antidote. That’s the reflection. The following questions should be considered: What can we improve? Are our goals still valid? But careful: Isn’t the reality also an illusion? For each key factor of the F.I.R.E.-Model, Dr. Jüttner presents some provocative theories that are supported by research results. He engages his audience and lets them actively participate in practical event demonstrations on stage. Mostly though he undermines his theories by using captivating, gripping and engaging examples from fire department and ambulance experiences. That way, his thought-provoking impulses about management and leadership under extreme conditions will remain a lively memory. And one thing is for sure: The audience won’t let anything go up in flames anymore.